Less than 24 hours after WrestlingDVDNetwork.com revealed the full content of the first-ever NXT yearly retrospective, another 2018 WWE DVD content line-up comes your way! 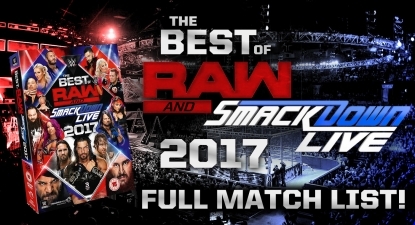 “The Best of RAW & SmackDown Live 2017” DVD will join “Best of NXT 2017” and “Best PPV Matches 2017” as WWE’s first 3-disc DVD sets of the new year. For the look-back at Monday Night RAW and SmackDown Live’s greatest moments this year, the company will be releasing a compilation of 32 matches and segments witnessed on the two brands between January and November. That covers a lot of ground and with it a lot of history-making moments; The Undertaker, Goldberg and Brock Lesnar sharing the same ring before Royal Rumble, Shinsuke Nakamura’s main roster debut and match with John Cena, Braun Strowman destroying Roman Reigns, the second Women’s Money in the Bank Ladder Match, Dean Ambrose and Seth Rollins sparking a reunion of The Shield, AJ Styles winning the WWE Championship in the UK, and much, much more! – UK/Europe: February 26th. Pre-order the RAW/SD 2017 DVD now here on Amazon.co.uk. – USA: February 27th. Pre-order the new RAW/SD 2017 DVD soon here on Amazon.com. – Australia: TBA. Look for a pre-order announcement in the coming weeks at Madman.com.au. I bought mine today and when I got it home and put it in all one has is Rick flare and his whole history of his career. So I took it out and looked at it. And my dvds are gold and blue and it says Nature Boy Rick Flare The Definitive collection. Is this the right DVds. All 3 discs are like this. I am highly pissed. You no like the Rick Flare Nature Boy? He a wrestling legend! Joe choking out Heyman is on there and Cass turning on Enzo is on there. Also the angle where Strowman kills Reigns backstage and throws him off the loading dock(which was better than any match they had) is on there. The NXT content reveal yesterday and today the R & SD reveal? Tis the season to be jolly indeed! Great work and happy holidays/Merry Christmas. “Plenty of good stuff”? From 2017? Okay, lol. It looks like they’ve favoured title changes over match quality and seems like there’s more SDLive probably as shorter matches but will be a good rewatch considering I’ve been out the loop this year on rise of Strowman etc. This release would have really benefited a HD release on Bluray as all the footage is in HD quality yet gets downscaled and released on lower quality in DVD, in this day n age where 4K Ultra HD is starting to take shape and entice the consumers in purchasing 4K physical media or streaming a multi-millionaire company is so far behind in terms of what is mainstream and barely make effort to release a higher quality physical media, yes consumers not purchasing as many wwe blu ray in the past has made a big impact in terms what WWE releases in blu ray but if you don’t put the blu rays out there worldwide for consumers to purchase then of course its not going to sell as well, look at movie 4K Blu Ray discs a lot of people said the physical media is going to fade out and 4K discs are going to fail yet people purchasing the 4k discs is doing considerably well based on reports and figures because there is actually loads being sold and proper effort is in place, i myself have actually started to build a 4k uhd disc collection and will continue to do so as it by far the best when it comes to quality as tv screen sizes are increasing you need the best physical media to compensate, just a shame that had to come on here and ramble about this as i would have almost 100% have purchased this release if it was on blu ray!! Everybody please give thanks to abpeaks for raising a topic that has never been discussed on here before. If enough people bought Blu-ray discs, they’d produce them. The demand just isn’t high enough. Or if they had proper distribution, people would buy them. Is it the chicken or the egg? No, it isn’t. WWE is a billion dollar machine, they can afford distribution. When a company like WWE isn’t producing Blu-Rays, it’s because the fans aren’t buying them and they didn’t get to where they are by continuing to produce merch that doesn’t sell. I didn’t say they can’t afford distribution. I said the blu-ray relases didn’t have proper distribution. Some BD’s were understocked, others were only sold with a limited release at certain stores instead of a wide release. The distribution in the US was shotty at best. And it was that way from the very first release in 2008. They nevet put their full distribution arm behind blu-rays. You either could never find them or they were only sold online or some other hoop that people had to jump through. “they didn’t get to where they are by continuing to produce merch that doesn’t sell.” You mean like the WWE Studios movie division that has rarely ever made money? Or their bodybuilding venture from the early 1990’s! the good thing is that I’m saving because of this.